Gasherbrum I (Hidden Peak) is the world's 11th highest mountain and one of the most remote 8,000 metre peaks! Gasherbrum I: Full Service Cost: $14,850, £11,450, €12,450; Basic Climb Cost: $9,850, £7,650, €8,250. KarakoramNews.com - Dan Mazur & Team, Sherpas& friendly locals enjoyed a safe and succesful summer 2018: K2 Summit & Trek, Broad Peak, Training Climb, Pastore Peak & Gasherbrums. 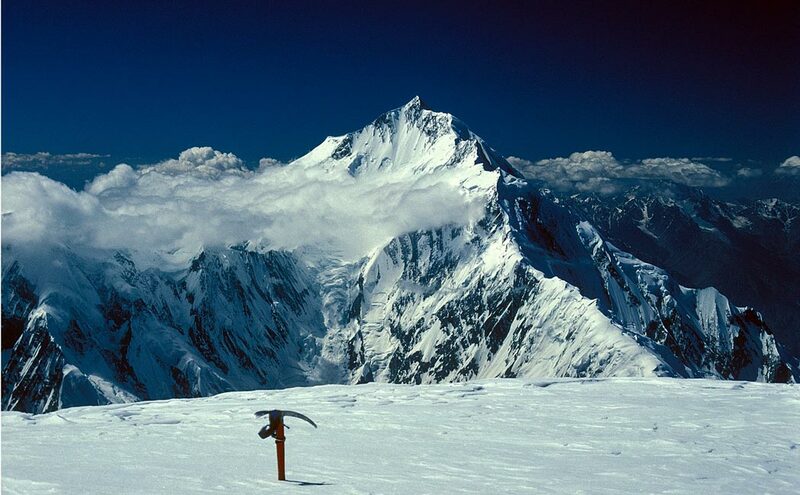 Climb this Karakorum 8,000 metre by itself or in combination the Gasherbrum II. At 8,080 m (26,510 ft.) Gasherbrum 1 (aka Hidden Peak) is the 11th highest mountain on Earth. Gasherbrum 2 is 8,035 m (26,362 ft.) is the world's 13th highest mountain.They are the most remote 8,000 metre peaks. Expert leader Dan Mazur has led G1, Broad Peak, K2 and over a dozen Everest expeditions successfully to the summit. 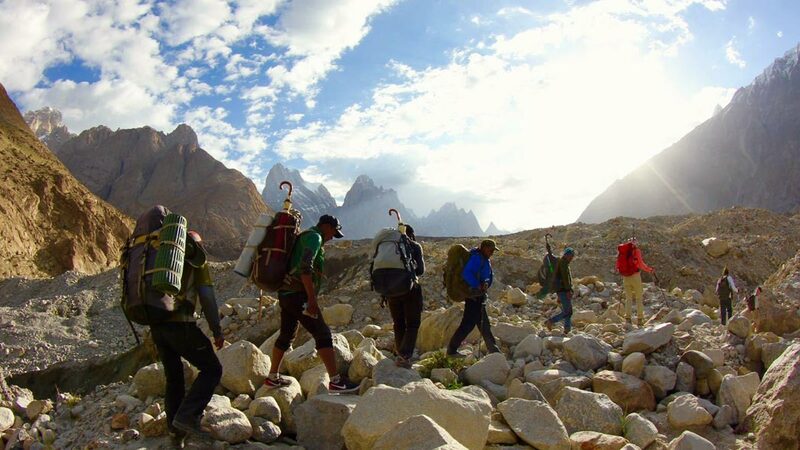 The expedition includes travel within the Karakorum, food, accommodations, staff, personal climbing Sherpas, and group equipment. Test yourself at high elevation without the crowd, and experience these two hidden gems in the world's most astonishing landscapes. Oxygen: You should consider whether or not you wish to use supplemental oxygen, which is optional on G1. We recommend a three bottle set for G1. The price includes three large 4 litre Russian Oxygen bottles, mask, regulator, hoses, as well as carriage to the high camps by porters. Extra bottles are available for an additional fee. We have a 30% buy-back policy on masks, regulators, and unused oxygen bottles in good condition. Day 13 – Trek To Gasherbrum Basecamp 5,150 metres / 16,896 ft.
Camp 1 is at 5,900 metres / 19,357 ft.
Camp 2 is at 6,900 metres / 22,630 ft.
Camp 3 is at 7,400 metres / 24,278 ft. Summit at 8,035 metres / 26,362 ft.
Camp 1 is at 5,950 metres / 19,521 ft.
Camp 2 6,400 metres / 20,997 ft.
Camp 3 7,300 metres / 23,950 ft. 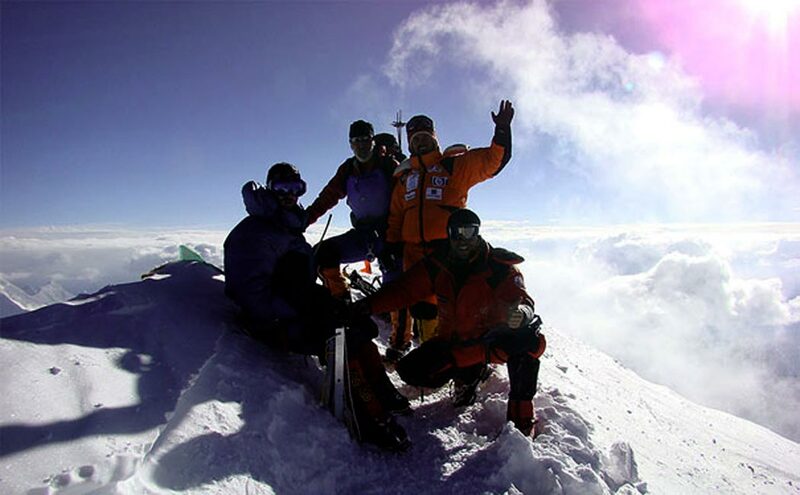 Summit at 8,068 metres / 26,469 ft.
Climbers must have experience with high-altitude mountaineering, snow, ice, and rock, and ascending/descending fixed lines independently. Proper conditioning is critical to your success on Gasherbrum 1 and 2. Team members are expected to be very fit and active winter climbers in good health.